Sehat was invited, along with a plethora of other startups, to take part in the 2015 Plan X Startup Demo Day, held at Arfa Technology Park in Lahore. Hashtagged as #PLANXDEMODAY, this event received a lot of hype on social media and within the tech/startup community in Pakistan. The event was inaugurated with a Skype call with Rahul Sood, founder of Voodoo PC and founder of Microsoft Ventures. He gave a few tips to various startups on how to conduct their pitches to potential investors. Sehat then proceeded to their own allotted stall at the event and set up shot. This involved the run-of-the-mill procedure of putting up promotional material in the form of a standee and a poster, along with setting up an iPad for passers-by who wanted to check out the features of the website. What followed was an enormous turnout at the booth by various startup founders, Arfa Employees, and participants. 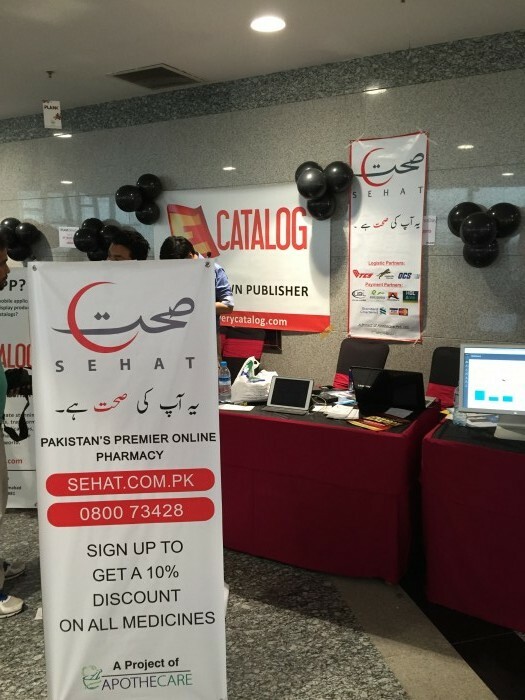 Sehat decided to offer registrants at the booth a 10% discount upon signing up to gain traction, and offered a select amount of participants a free “gift” from Sehat, in the form of medicine packaged in Sehat-branded box. There were many other startups at the event with cool ideas besides Sehat. Autogenie, a startup founded at the LUMS Centre for Entrepeneurship, focuses on sending people over to your location in Lahore wherever your car has broken down or malfunctioned – similar to the concept of AAA in America. Another service by the name of ECatalogue offered catalogue creation services for companies which users could view through the ECatalogue app – this saves said companies time and resources in showcasing their products.